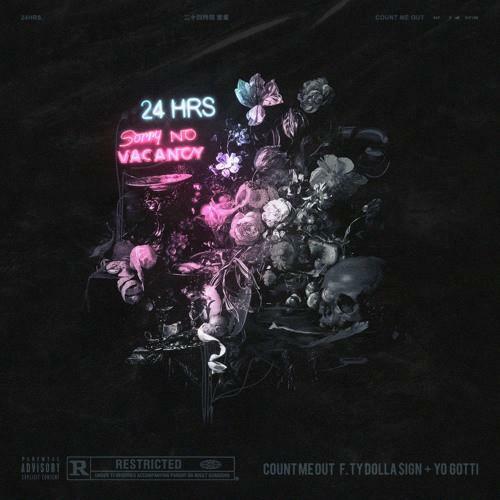 The mysterious 24hrs is back again, this time with "Count Me Out," a collab with Ty Dolla $ign and Yo Gotti. The track premiered tonight on OVO Sound Radio. Shrouded in mystery, 24hrs is a faceless Atlanta-based artist who appears to be on his way to becoming a viral sensation. Matter of fact, he's pretty much there now, as he's nabbed two A-listers in Ty Dolla $ign and Yo Gotti for his latest track, "Count Me Out," which was premiered by Oliver El-Khatib tonight on OVO Sound Radio. The collab comes days after the singer shared a new 4-track EP, 12:AM, which also came with a Gotti feature, on the Murda Beatz-produced "Twenty Revenge." Combining a delicate melody with hard trap percussion, the backdrop inspires a dreamy late-night club track. 24hrs and Ty both deliver enchanting auto-tuned flows and Gotti supplies a cool veteran's verse to close the song, nicely complementing the youthful presence of 24hrs. "Count Me Out" is produced by ISM Beats.